Dive Into Some Great Underwater Fiction!! Review copies "Of Ice and Steel"
Even at an early age, D. Clayton Meadows knew he had to be a submariner. Inspired by stories told by his grandfather, D. Clayton planned a life under the sea. He saved allowances and did jobs around local farms to earn money for books about submarines. After high school he enlisted in the United States Navy. After graduating from submarine school, D. Clayton was assigned to the USS RAY SSN 653. D. Clayton completed the rigorous submarine qualification process in half the normal time. It was on USS RAY that D. Clayton participated in the first ever surfacing of three United States nuclear submarines at the North Pole. Between deployments, he began building highly detailed submarine models. After his tour on USS RAY D. Clayton was assigned to the NAVAL SUBMARINE TORPEDO FACILITY where he maintained and tested the Navy’s MK-48, and ADCAP torpedoes. On shore duty and with more time on his hands D. Clayton began building fully submersible, highly detailed radio controlled submarines. In 1989 he married his wife Susan. Following his shore tour he was assigned to USS MIAMI SSN 755, D. Clayton relocated to Groton Connecticut. In August 1990, D Clayton was transferred to USS DALLAS SSN 700. During this time DALLAS participated in Operation Desert Storm. While deployed in support of the war effort D. Clayton received word that his wife had given birth to their first son. Upon return from deployment, D. Clayton organized the first ever model submarine regatta. This event is now an annual affair and draws thousands from all over the world. D. Clayton was now a First Class Torpedoman. He qualified and stood the watch as Diving Officer, the only First Class to stand that duty. The USS DALLAS deployed again this time far north. Details of that operation remain classified. D. Clayton was awarded a second son on his return from the Arctic. Completing his tour on USS DALLAS Meadows was detailed to NAVAL SUBMARINE SCHOOL. He began writing articles for various magazines dealing with model submarines, and naval history. By now his writing and models were winning awards and in demand. His models grace the desks of government leaders, celebrities, and collectors. In September of 1995 Meadows was advanced to the prestigious rank of Chief Petty Officer. A year later he was at sea again, this time as Torpedo Division leading Chief on the Improved Los Angeles Class USS SPRINGFIELD SSN 761. He deployed three times while on the SPRINGFIELD. While on board he began his first novel. He only worked on the manuscript while the ship was submerged. He ended his Naval career while serving on SPRINGFIELD. After leaving the Navy D. Clayton concentrated on his writing and modeling. After the attacks of 9/11 he attempted to re-enter the Navy. After being refused due to over manning he joined the Army National Guard. He serves as a gunner of an M1A1 Abrams Main Battle Tank with Charlie Company, 1st Battalion 263rd Armored. He lives in Charleston South Carolina. D. Clayton Meadows takes the advice of "Write what you know about," to heart. Having served 22 years on nuclear submarines the reader can be assured the details will match the characters and story line in a rich exciting blend. "An extremely engaging tale that grabs your attention and doesn't let go, OF ICE AND STEEL poses a thought-provoking cataclysmic undersea contest across a vivid fabric of space and time! Don Meadows combines an impressive natural storytelling gift with a veteran submariner's powerful grasp of modern and U-boat traditions and tactics!" PPS DIESEL BOATS FOR EVER!!!!!!!! A perfect blend of fiction and nonfiction, told by an experienced submariner. It just doesn't get any better than this! I am not much of a book reviewer, but I can tell you this . From the moment I began to read this this book , I had a very hard time putting it down ! The graphic descriptions of the characters , situations they are placed in , the machines and the men and women they command , left me in state awe , it made me feel as if I were their with them , in this very well played out story ! Many folks over my time , I have heard them say ," I read the book before I saw the Movie " , and I never really undestood what they were talking about ! This time when the movie comes out , I will be in their shoes . And I have no doudt , that a moive verision , held true to the book , will go down as the BEST SUBMARINE MOIVE EVER MADE ! That is a big boast I know , but when you read this one you will understand what I mean ! I believe that what man puts down on paper , Constitutes a mans makeup in life , if this is the case , then Mr, Meadows, "The Author " of this book , has in his life experienced the very best of what this world has to give to those who make it , and was able to wright down about the very evil the we all have know in this world . It all lies between the pages of his great book . I just finished my copy of "Of Ice and Steel", and what a great ride it was!Chief Meadows weaves a great story; Russian, American and German submarines in a story that crosses time, with plenty of action across the globe. If you are looking for a fast-paced action novel that keeps you turning page after page, look no further. It's in this book. Do yourself a favor and pick up a copy; you will not be disappointed. From WWII to the present, you'll be carried away by Chief Meadows' tale. My understanding is that Chief Meadows is already at work on a follow up to this story. I'll be ordering my copy the moment it hits the bookstores. Highly Recommended! Of Ice and Steel...Fantastic! I have to say this is one of the best stories I've read in a long time. The blend of WW2 and the present day is outstanding! The science fiction twist. Incredible and realistic. It does not feel like science fiction in any way. When I did the book cover for Don I knew very little about the book as it wasn't finished. When I finally read it I was spell bound with every page. The characters are strong and endearing. This story keeps you on the edge of your seat right to the very end. In my opinion there has never been a navel story as original and effective as Of Ice and Steel. 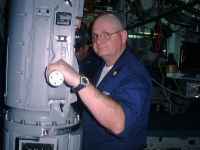 Don's 18 years of service on board submarines shows his vast knowledge of these boats and the military that a writer who was not involved could have never written in such an accurate fashion. This book will make you feel good about being a human being. It will give you hope for the future and raise you up. Not down as so many stories do today. And the ending? Well I can't tell you about that but it will move you very deeply. In the spirit of the movie the Enemy Below this is a story about opposing sides of a conflict can pull together to work together as human beings. Every page is pure magic. I couldn't put it down if I tried. This is destine to be on of the greatest books of it's kind. Don hits all the marks just perfectly with his first book and I can't wait to read the 3 other books in this series. Buy it! Read it! This book would appeal to anyone regardless if you have an interest and navel battles, hardware and world conflict. It's about people arising to an occasion in compassion and heroism. And it's a great story. Period.